I'm a big fan of the #NoEstimates movement. I've seen multiple talks, I fight against "story points" and other forms of estimate waste whenever possible, and I trumpet the "new" movement in agile of having no estimates. 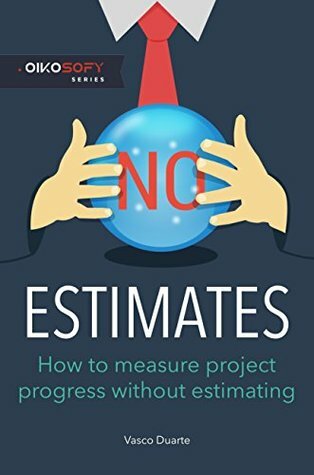 I recognize that estimates are a tremendously bad way of achieving predictability in software development - in short, estimates simply do not accomplish what they are meant to accomplish, and are thus a total waste of time. But I do have a dirty little secret... I don't really have an alternative.I go around various places of employment saying that estimates are a waste of time, and they are, but when stakeholders, product owners, and business people try to get me to explain how they're supposed to get a sense of when products will be delivered without them, I wave my hands and mutter something about how you can achieve greater predictability using real data and tracking your team's throughput, cycle time, and lead time. I know I've heard people say this, and it makes sense to me, but I don't really know the specifics, and I've had a hard time finding them. I seem to get away with this nonsense simply because, as it turns out, businesses don't really need predicability as much as they think they do. Marketing teams and salesmen tend to work better when they're selling or marketing what's already done, rather than what's going to be done "soon". And business stakeholders, for all the claims to the contrary, never actually seem to use the relative estimation/cost for various projects to actually decide what projects to do - it always seems like there's a "most important thing" that needs to be done no matter what. We have an industry where tons of people are convinced that they need to know the exact date features are going to be done, but my experience has shown me time and time again that they actually don't need that, most of the time.Notice I keep saying "most" or "usually". There definitely ARE times when companies need to get a sense of when something's going to be done. I know estimating doesn't work for that purpose - I'm fully convinced and on board with that idea. But I've been long seeking an understanding of how to achieve it for those situations when it's needed, and I've mostly gotten away with simply not having to know. My hope going into this book, which presents itself as largely the complete guide to the #NoEstimates movement, was that it was going to answer this for me.In the end, it still felt pretty hand-wavey, I don't think I came away with what I wanted. The book plays a lot of lipservice to the notion of predictability without estimates, but I felt like it largely does what I keep doing, which is kind of deal in vague terms and assure the audience that it's possible, without really making someone understand exactly how. The final two chapters deal most directly with this question - everything leading up to it is mostly about why estimates are worthless and how much better off you'd be without them. But the last two mostly attempt to deal with predictability and they do an admirable job, but still felt a tad vague. There's quite a bit about how one can measure progress and know if your project is going off the rails, which is helpful I guess, but not what I was looking for.Agile books can be kind of "culty" in nature, like they come across like someone trying to convince you to join their religion. This one is no exception, a tone that I felt was exacerbated by the unfortunate decision to write much of the book as a hypothetical fictional novel. There are characters working jobs and trying to deal with problems, and of course there are super-smart characters who explain the principles of the #NoEstimates book, and of course they wind up being completely right. One particularly hilarious scene near the end has the big boss character excitedly telling the main character, Carmen, that he's never seen anyone work so well, and he demands that she and her #NoEstimates buddy (Herman, get it, "her man"?) come work directly for him. It's so dorky and ridiculous, kind of has the same vibe as an infomercial where someone can't open a soda bottle right until Billy Mays comes in and says he's got the perfect product that will solve all their problems. It reminded me a lot of how The Phoenix Project was written, but at least that book stayed consistently in "novel" mode, not switching back and forth. At one point, Herman actually gives Carmen a copy of the #NoEstimates book in which they are characters, Neverending Story style, wrap your head around that one.But here's my fundamental problem: #NoEstimates, the movement, is something of a new agile cult, and I know it - but I'm WAY bought in. Estimates are a complete waste of time, and I'd rather simply avoid them entirely. If this is a religion, I'm a devout member, even though I don't really understand all the sacraments or whatever. So even though I didn't feel like this book really helped me come away with how to answer the "okay smart guy, how do I get predictability then?" question, I'm still way, way bought into it. Like I said, I think people need these dates/predictions far less often than they think they do, and in my opinion it's better to simply say "I don't know" than to outright lie, which is what estimating is.I recommend everyone working in this space read this book, at the very least to absolve you of the notion that estimates are valuable and worthwhile things to produce. I loved most of the book, but I had to knock a star off because it ultimately DOES fail to provide the sort of "silver bullet" I'm looking for. I'll have to keep searching for the book/post/video/lecture/conference that actually helps me understand how to have predictability without estimating - I mean, I'm sure it's possible, using cycle times and throughputs and whatever. Right? This book was a suggested read by a colleague. So, what can I say about it?It's hard to dismiss that our industry has a knack for turning estimates into commitments. I assume that's partly because our brain just anchors to the first numbers it heard (see Kahnemans Thinking fast & slow). Probably that's just how we humans tick. Undesirable, but unfortunate reality.I always tried to work my way around estimates with corridors and probabilities wherever I can, especially to communicate uncertainty and use forecasting techniques afterwards. It has already helped me to survive unrealistic project expectations multiple times, but that should not be an excuse to look into alternatives that could do the job better. NoEstimates seems to be a good fit for that.The core of the book is explained via a fictional business story that follows the typical "Heros Journey" template. A manager in trouble, seeks help by a mentor figure who teaches him new ways of thinking, which ultimately achieve the impossible, saving the project. If you know Goldratts "The Goal" or Kims "Phoenix Project". You get the idea. Of course everything is slightly exaggerated, in order to emphasize the message.The central ideas behind NoEstimates are- Getting story size variability down- Using past data and story cycle time for forecasting- Using corridors for forecasting (optimistic & pessimistic)- Focussing on value and scope management for adjusting deliveriesAll of those seem to fit nicely with what I've learned from Gene Kim (Devops Handbook, Phoenix Project), David J. Anderson (Kanban), Goldratt and other agile influencers. The book gave me enough additional insights, to be tempted to try out the techniques in the next milestone of my current project. Let's see how that goes.All in all a quick, enjoyable read. This is all about Agile development and #NoEstimates. The book spends about 60% just telling you that traditional software estimates are wrong and restates the same basic arguments many times. You'll see the same diagrams hauled out in the first chapters then again later, and again.If you're interested in Agile development and dropping estimates this is an okay book. I have a feeling that there is better out there though. Interesting but not a lot that is new for people who have read up on agile software development. The approach of telling a story of a project manager in a fictional company kept otherwise dry material interesting. But at the end of the day it felt light on guidance on how to actually implement "No estimates". It seems to boil down to continue writing stories until you get to the point where none of your stories are longer than a day. That is a drastic oversimplification but if someone who has read Kent Beck's books on XP and the planning sessions will see that as the major tweak to what Kent has been advocating for years.The section on weening yourself off estimates by story points was the most practical but not earth shattering. The part about slicing stories was what I found the most helpful although it would be nice to see it presented more in a pattern format and perhaps with a few more examples. Although I liked the book and the fact that it was not too long, I could not help feel it fell a bit short of my initial expectation. Guess I was expecting a bit more of actionable recipe, and not so much insistence against a background of waterfall process, that everyone knows does not work. Maybe my expectations were not that realistic, but that being said, one has to be fair to the book and recognize that some of the advice and tactics here can deal with all that is broken about "agile" in many companies. I put "agile" in quotes because now that everyone claims to be agile and it has all the hallmarks of a faith-less religion, that is, empty liturgy and ceremony, there are a lot of anti-patterns and "un-agile" behaviors to be found in "agile" projects within companies that fancy themselves to be agile when they are lacking in varying degrees. In that common scenario is where I think it would be possible and useful to evangelize some parts of this #NoEstimates approach. All in all, I liked the general approach and it looks like it is a less wasteful way of forecasting (as opposed to estimating). I would still have to put it in practice, which is an altogether different battle. This book describes the agile process but in a very painful method. It drags out concepts rather then explaining them briefly and concisely. Also the book needs an editor, it uses a lot of broken English, which further detracts from the books purpose.